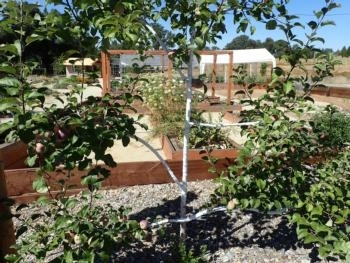 Liberty apple espalier in the Sherwood Demonstration Garden Orchard in El Dorado County. Thinking about planting a fruit or nut tree? Fall is the perfect time to start planning the steps for a new tree or trees, including variety selection, location in the landscape and planting plan. Most gardeners use their taste buds during summer and fall harvest to identify fruit and nut varieties and cultivars that have desired characteristics. Additional preparation in the fall can make for an easier and more informed process for winter procurement and planting of bareroot fruit and nut trees. Identify a location for fruit trees where they will receive full sun 6 or more hours per day during the growing season, too much shade will affect the quantity and quality of fruit produced. If you don't have loose, well-drained soil you may want to amend the soil and add compost, or fertilizers. Selecting a quality tree and caring for it increases the chances for success. This begins with selecting a tree from a quality nursery. At the nursery this winter, select bareroot trees that appear strong, healthy, and do not show signs of disease. Planting of bareroot trees should take place in winter, between December and March. Dig a planting hole just bigger than the depth and width of the roots, it is best to leave a “pedestal” or to leave the soil below the root system undisturbed to help prevent the tree from settling. Fruit trees should be planted high to help avoid crown rot disease. 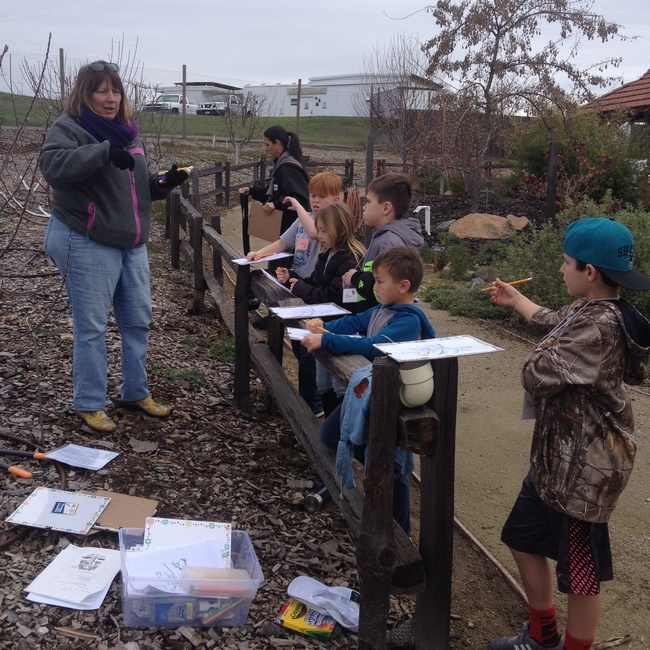 A UC Master Gardener volunteer working with schools on a field trip to the Sherwood Demonstration Garden in El Dorado County. Once your trees are in the ground, having a thorough understanding of how fruit and nut trees function for proper pollination, bud formation, and fruiting will help you more effectively care for your trees. The UC Master Gardeners of El Dorado County have gathered an excellent team of experts to teach about tree factors and show you how to take advantage of pruning techniques that allow your trees to obtain better sun exposure, better airflow, and better structure for easier netting and pest prevention. Join the UC Master Gardeners of El Dorado County, on Nov. 2 for a new workshop titled The New Backyard Orchard, at the Cameron Park Community Center. The New Backyard Orchard workshop will help you choose the right tree varieties for your region, plant trees correctly, and shape trees to make them attractive, as well as high-bearing. You'll receive a thorough, scientifically correct understanding of how trees generate fruit, to help you understand how to manage your orchard. Whether you have just a tree or two, or hope to expand your food supply through intensive backyard orchard development, this workshop is for you! UC Master Gardeners who attend will earn four hours of Continuing Education credit. To learn more and to pre-register, please visit our website at http://ucanr.edu/mgedc-workshop or register at http://ucanr.edu/mgedc-workshop-reg. If you have questions, please call (530) 621-5528.